How often should I bathe my chow? I am going to be a new chow owner and he is arriving Thursday so I have some questions about grooming. This part seems to be very subjective since I've seen as frequent as bi-weekly to twice a year and when it gets dirty. I've read that chows do not have a dog scent so how often should I bath him? 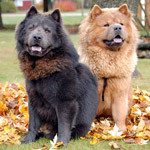 When does the adult coat usually come in the chow is going to be 4months. Well I think that is it unless you guys have any tips for a new chow owner. Re: How often should I bathe my chow? 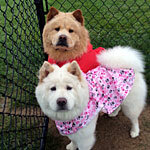 Hi there ... from what I understand chows are a very clean type breed. Although our Leo does like to roll over on interesting scents he finds and gladly he hasn't done this on poo yet. 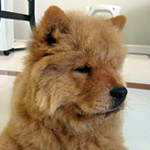 The biggest reason for not bathing a chow alot is that the bath actually is very drying to the skin and chows are susceptible to dry skin due to any number of reason, two of which would be poor food or allergies and over bathing. I have read that some chow owners only bathe 2-4 times per year. I think it depends on your chow and the condition of their skin. Now, our boys are 16 weeks old now and we've bathed them three times already. Mostly because they play in our garage when it's too cold outside and get pretty dirty. The other reason was before I found the Oster wash-clothes (same as their dog shampoo) for spot cleaning (their under-bellies start to smell like pee after a couple days 'cuz they spread their legs instead of lifting one while doing their business). Plus, they're active little guys and just get a bit smelly so I do spot cleaning in between baths. Recently Leo has been scratching on his hinds and our Vet check showed dry skin. She suggested adding Fish Oil to their food to help with this. I split open a capsule, spread the oil on the food, shake it up in a bowl, then add it to their dishes. 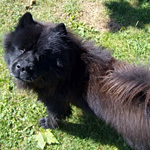 Another chow owner on this site also adds Fish Oil for skin, but I can't remember if it was Ursa's Dady, Rory's Dad or Victory. Anyway, this is how the vet suggested we supplement for dry skin, aka Hot Spots. I also asked the Vet about blowing their puppy coat. She said that this is as different from breed to breed as it is from chow to chow. So, anyone's guess is good. Our pups are four months and are barely shedding during their regular brushing. Mostly from digging out debris from their romps in the weeds. When was your pup born? Ours were born Sept 17th. What is your pups name? And, you are correct about the trimming. DONT DO IT! Their double coat is insulation both for cold in wintertime and for heat in summer. The brushing is good for their skin because it removes dead skin, too. So, get your pup accustomed to regular brushing very early. Loo took a shower once, and that has been it in the 2 1/2 years he's been with me! He was drenched in manure and I had no other choice. I'm old school, had my first dog when you didn't bathe dogs so you didn't damage the natural balance of their skin and coat. You dry them with towels when they're wet and dirty and brush out the leftover dirt after it's dried. Sarahloo wrote: Loo took a shower once, and that has been it in the 2 1/2 years he's been with me! He was drenched in manure and I had no other choice. Mine are 8 and soon to be 9 and have not been bathed. Neither one of mine have been bathed but you need to stay on top of brushing. Nahkohe's groomer said he has plenty of the natural oils which makes it easier to brush. Shiloh likes her kidde pool and goes in often - it doesn't really count as being bathed. I bathe Ty about once a month to once every two months for the same reason Becki bathes Lily. When I take Ty to the dog park, he can come back black underneath. I do let it dry out and brush out most of the dirt, but it starts to add up and being that we live in an apartment and there's not a lot of space...he gets a bath! And I blow dry his coat, but this is with a power dryer I use at the pet resort which blows cooler air instead of hot so it gets out most of the water, but doesn't dry out the skin. I also give Ty fish oil tablets (Though I've been slacking of late because he's been doing so much better since the hot spots, bad mom!) and that helps with the needing of more frequent baths. I also find that his fur is a lot nicer when I do it about that often versus longer. It starts to get shaggy and gross even after frequent brushing if I wait too long. I guess it depends on the chow and how often yours get dirty! Skadi gets a trip to an off leash dog park once a month. She enjoys rolling in the mud and mucking about in the shallow water on the edge of the dam. The first trip to the park, She walked into a particularly muddy spot, paused for just a second and then very deliberately smacked her head right into the mud puddle. When she looked up at us again, half her face coated in black gunk, she had the biggest grin. We have to bath her after each trip. So she gets bathed once a month. Right now, its summer and she's loosing a lot of her puppy fluff, so I'm currently brushing her every day. Clumps of fuzz coming out! Otherwise, she gets a brush once a week.